The PILA Series Outdoor Showers are characterized by its simple clean lines and elegantly designed shower head. 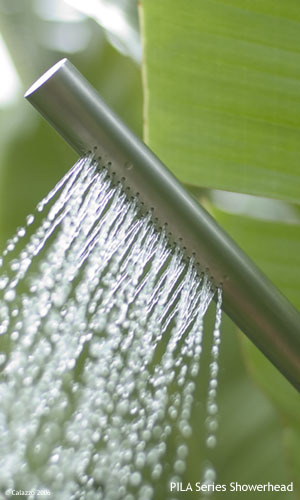 It will transform your garden into a tropical paradise with our stainless steel shower with hand crafted teak base. The shower head is individually handmade with precision machined nozzles to give you total control over the intensity of your shower with a twist of the handle. 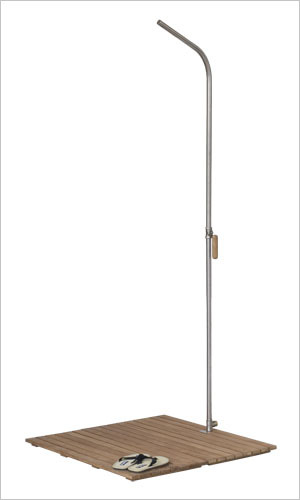 The perfectly sized teak base is assembled with stainless steel hardware for durability. An adapter is included for connection with a standard garden hose. All 316 (Marine Grade) Stainless Steel construction for outdoor durability. - Free standing design comes with 36"x36" reinforced teak base. - 316 (Marine Grade) Stainless Steel construction and hardware for durability and corrosion resistance. - 1 inch diameter thick walled body. - Designed specifically for the outdoor environment; ideal for beach or pool. - 316 Stainless Steel WOG rated ball valves. - Commercial Quality design and construction. - Single supply feed designed for connection to cold or pre-mixed warm water source. - Inlet sized for 3/4" pipe thread or use supplied stainless steel adapter for connection with standard garden hose. Availability: Ships in 3-5 days.